Forty-one cholera cases have been confirmed in four regions of Algeria the state-run Algerian Press Service reported. According to the Algerian Health Ministry, the outbreak includes Algiers, Blida, Tipasa and Bouira. About 88 suspected cases have been reported, the Director General of Prevention at the Ministry of Health, Population and Hospital Reform, Dr. Djamel Fourar said. All the hospitals in central Algeria have been mobilized to deal with the outbreak, he said. The ministry has formed a contingency team after drinking and waste waters mixed due to bad networks’ connection. It advised against visiting patients at hospitals to avert further spread of the highly communicable disease. Laboratory examinations aimed at determining the causes of the epidemic are ongoing at the Institut Pasteur, according to the director general of the Institute, Dr. Zoubir Harrath. Cholera is an extremely virulent disease that can cause severe acute watery diarrhea. 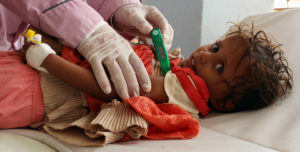 Symptoms appear between 12 hours and 5 days after the ingestion of food or contaminated water, according to the official website of the World Health Organization. Earlier this year, an influenza outbreak has killed scores in Algeria. The country’s health system is deteriorating, and yet its budget keeps getting bigger. Spending on the health sector rose from €2 billion in 2010 to €3.5 billion in 2014. Posted by Geraldine Boechat on August 24, 2018. Filed under News. You can follow any responses to this entry through the RSS 2.0. Both comments and pings are currently closed.